A Florida man who refers to himself as the “Gator Crusader” has taken the term “man’s best friend” to a whole new level. 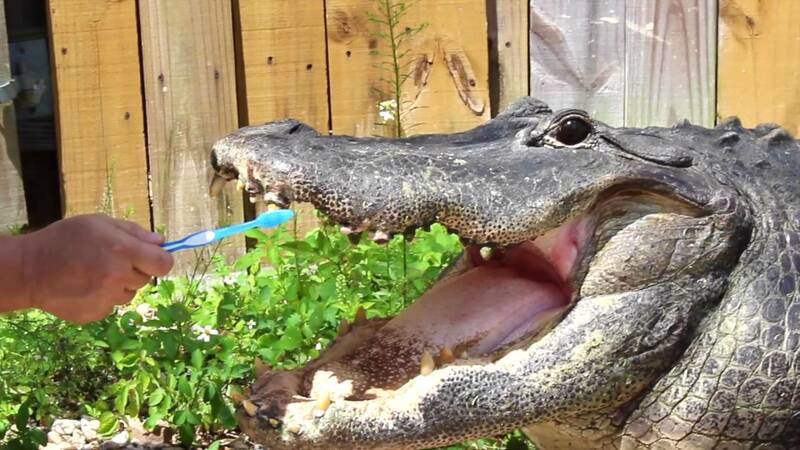 Meet Chomper, one of the many alligators Michael Womer of Orlando calls his children. And, like any doting dad, Womer brushes the deadly reptile’s teeth in a video posted to his YouTube account. In other videos, he can even be seen letting an alligator bite a hot dog out of his mouth in what he calls “the deadliest recreation of ‘Lady and the Tramp'”. He said the gators at the attraction where he works were all rescued from alligator farms, where their ultimate fate was to become wallets or boots, and may be grateful that he saved them. “Maybe deep down, somehow, instinctively, they know,” he speculated. Womer explained that in the 25 years he has worked with alligators, he has learned that the secret to making sure he doesn’t become dinner lies in understanding their movements. In addition, he feeds the reptiles treats as positive reinforcement. When he first started out, Womer said he practiced jumping on the alligators and wrestling them, which led to many close calls, including being bitten a few times. “But since I stopped doing that and focused on training the gators, and truly developing a relationship and understanding their behavior, I have not been bitten,” he said. He explained that his greater goal is to spread awareness about compassion toward alligators, who often catch a bad rap for their predator designation.